From the maybe not-so-comfortable position called “middle C position” that we practiced in Part 1 of learning how to read notes, this time we'll move the hands apart for a better posture at the piano. If you missed that lesson, click here to do it first. You will also finally start playing both hands at the same time! Fasten your seat-belts: This is fast learning for the not-so-patient learners! Say "Hello" to Bass C! Bass C is found one octave (8 steps) below (to the left from) middle C. It is a lower pitched C.
This exercise uses only the middle and the bass C. It exercises your eye-hand coordination, by having to follow the notes up and down with you eyes and coordinate your hands. Very easy! This time, count the rhythm instead of singing the note names (they’re all C anyway..!). I have added bar lines (the vertical lines that divide the score in parts, called measures or bars), rests and time signature (4/4). This does not really change your playing in any way, just observe how the time signature (the two numbers in the beginning of the staff) tells us how many beats per measure (top number) and what note value that gets one beat (the bottom number). In this case it is 4 beats per measure, and the bottom number 4 means that the quarter note is worth one beat. Observe how each measure adds up to four beats, but with different note values. The small numbers are your finger number that plays that note. For this exercise, use only fingers 3 in each hand. In the following exercise we will add Treble C that is located one octave higher (to the right) than middle C.
So now we have three C’s: The Bass C, the Middle C and the Treble C. These are the most commonly used as you begin reading music notes for the piano. You will play the treble C with your left hand, though, crossing over your right hand. Fun! Continue to use only finger 3 in each hand. Here you will play the notes next to C; D and E, and continue to cross over your left hand for the treble C, D and E.
Exercise number 3 introduces the dotted half note, and meter in three. The time signature now tells us there are three beats per measure. The dotted half note is worth three beats (when counting the beat as equal to a quarter note). Play and count along. Exercise 4 is adding the notes F and G. You will now use all five fingers in each hand to play. This position on the piano is called the “C position”. This little melody is also great as a warm up each time you start practicing piano! This time I have added eight notes. They are faster notes, two on each beat. You can say “run-ning” or count “1-and” for each pair of eight notes. The final exercise in reading music notes is using both hands playing at the same time. The notes that are played simultaneously are vertically aligned on top of each other. Practice first the one hand, then the other and finally both together, very slow at first. When you feel comfortable, increase the speed gradually. Congratulations! If you have come this far, nothing can stop you! This was a "crash-course"' in two parts to help you see how reading music notes for piano "works". Most piano courses will do this progress over many, many lessons. But I think that with this way of using guide notes (Bass, middle and treble C's) and learning to see how the notes move with larger distances, is a much quicker method (for adults). 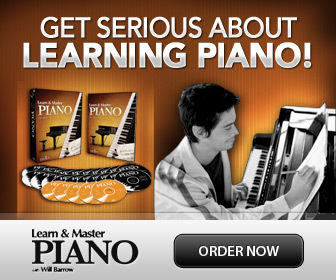 If you want to become better at reading music notes a great piano software that teaches you to play piano and read notes is eMedia's Piano and Keyboard Method. You can read my review about it here. What do you think? Was this hard or easy? Leave a comment below! Thanks!